The biggest challenge for agencies and marketers in 2019 is the uncertainty and unpredictability Brexit presents. PR (& marketing) is often the first budget to be cut when companies are not performing well. Bellweather reported recently that marketing budgets are stagnant after 6 years of growth. The unpredictability of Brexit will mean that it’s even harder to rely on new business pipelines - agencies just won’t know when projects are likely to get signed off and many will be postponed. Agencies need to have more in the pipeline just to hold steady. Agencies should ramp up their new business activities as much as possible. Don’t just rely on your new business team or person, but get everybody involved from leadership team down. Are you all really making the most of all potential contacts across the agency? Agencies will continue to need to show their value by being able to provide measurable results from their campaigns that are linked back to business/corporate objectives. Improving and changing technology in different sectors will help track different KPI metrics. The more an agency can link it’s work to the client’s bottomline, the more irreplaceable it will become. This is what all clients really care about. They really don’t care about the agency ecosystem and brands. There is also a predicted increase in the use of ad blockers which means brands will invest more in content marketing, influencer marketing, referral partnerships and media relations to deliver value to their audiences. Many companies will be looking beyond Europe. The Rose Tree, a British beauty brand, is an example of this who has now secured distribution in Malaysia. Marketing is now global and UK agencies should also look to other markets - agencies that have deep specialisms are the ones performing well. If you get luxury, and the luxury customer, that has global translation. To define in or out of house, agencies need to look at their own resources and work back from there to scope out needs. Prospective clients don’t buy an agency because of their marketer or new business person. They buy the team that’s going to be working with them so having a very senior new business person is often unnecessary and not cost effective outside of a global network. People who seek in-house roles often prefer the marketing element, so it’s often worth seeing what an external partner can provide. It’s essential to hire someone experienced with a proven track record of delivering tangible results. You may have talent in the agency who would love to get involved in agency marketing. It’s unlikely you’ll find someone that can do the pipeline building, research, strategy, marketing and copywriting. Look for someone external that can complement your existing resources. There is a continued trend for brands to build in-house teams due to increased pressure on margins, continued distrust of agencies and lack of transparency and even where brands aren’t building in-house teams they are building dedicated agency teams that are far more integrated than before. At O2, the media, PR, advertising and CRM agencies are now co-located three days a week. The likes of Unilever and Procter & Gamble are also asking cross-agency groups to work together. Agencies can respond to this by offering their own on-site embedded teams or creating new solutions for companies building in-house agencies and also most importantly demonstrate how you can work hand-in-hand in a collaborative way with in-house teams. Agencies need to think about what they can do to stand out. They need to go against the grain. When all agencies are sending out email marketing campaigns, consider nice handwritten postcards to get a better response rate. Be prepared to build relationships and add value. You can’t force a clients hand either - you are building softly until they are in the market to buy. Agencies need to be fully resourced in data, social, content and digital as well as the more traditional pr skills. PR and SEO teams will need to work much more closely together and so PR agencies should either have strong links with an SEO specialist or recruit for these skills. Creativity will be key - the best creative ideas are what will differentiate one agency over another. Building a culture where creativity flows and where people can naturally come up with their best ideas is key. New business for agencies is going to continue to be tricky. Sending out mass, unpersonalised emails stopped working years ago yet many agencies continue to do so. To stand out, agencies need to do what they do best - think and act creatively. Personalisation is key, think about your approach to prospects and make it as personalised as possible. Agencies shouldn’t just rely on email and phone. Since GDPR we have noticed that emails don’t have the reach they used to and marketers just don’t take phone calls anymore. New business is about covering all bases - from content, through to social media & marketing, through to running events, building your agency profile through speaking and networking. Agencies who have a narrower focus, yet can be agile enough to respond to ever-changing needs are the ones that will thrive. 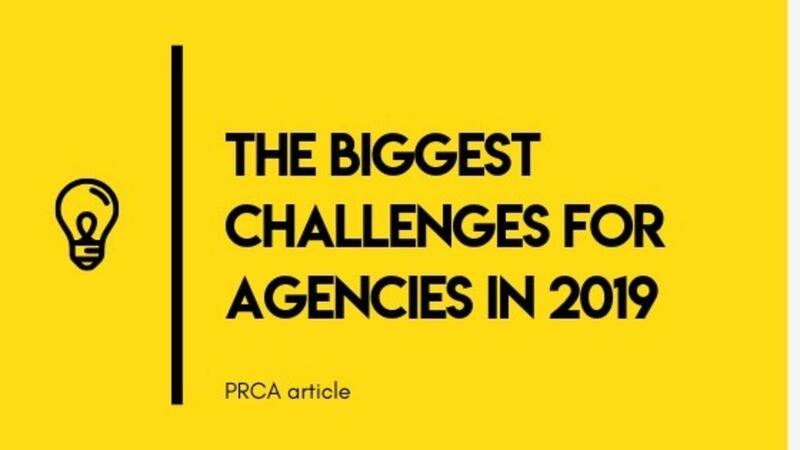 *This article was originally posted on the PRCA Blog - https://www.prca.org.uk/The-biggest-challenge-for-agencies. The Public Relations and Communications Association (PRCA) was established to help develop and nurture best in class public relations practitioners.